I've been known to cry on the phone. Not just "Help mom I moved to Alabama" type of crying. Nor the hormone-fueled and husband-directed "Why didn't you tell me you don't like my new boots?" type of crying. But rather, "Please explain to me again how the $2,500 out-of-pocket maximum isn't subject to my deductible because of the coinsurance minimum per calendar year?" It's true. Health insurance billing departments have made me cry. And it's so embarrassing - them calming me down with a patronizing "I understand, Ma'am. It can be confusing." Once I even anticipated my tears and just hung up mid-sentence. "Hey guys! We've got a crier," I'm sure is what the representative proudly said. It's like Algebra 2 all over again. They can explain stuff over and over and still lose me each and every time. So out of desperation I've said things like, "Excuse me, Sir...Ma'am...Mister. Could you please start over? But this time, pretend I'm in kindergarten. Starting with the definitions of deductible and subject to. Please. Thank you." And then I'd bite my lip to stifle a sob and mumble real fast under my breath, "Thanks-'preciate-it." Is this all too much to admit? Me not being adult enough to stand-up to the condescending health care billing representatives of the world? I'm thinking it might be. Somebody stop me. But then one day shortly after my latest phone crying incident, something beautiful transpired. I called the 1-800 number on my vacuum cleaner to....well, for lack of a better word, complain. Probably the first time in my life I did something like this. Because only weird, pale, daytime television viewers call the customer service phone numbers on the back of their appliances, right? "Look. You're not hearing this from me. But I'm human, too. And if you don't like your craaappy (hold on to the a) vacuum cleaner, then you don't like your craaappy vacuum. What I'm saying is this - I'm just a peanut over here. Really low on the totem poles. And you know that I know the sticker on the back of your craaappy vacuum says not to return to the store. But try it. Because I'm just gonna tell you to check this hole and that hole - which might help. But no amount of trouble shooting is going to fix how cheap your craaappy vacuum is. And if the store won't take it, we will." 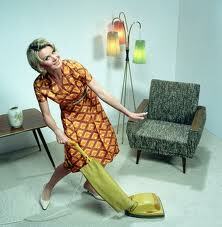 Ah, vacuum lady to the rescue! I could have kissed her. It was one those moments I thought, "Where is a phone survey after-the-call-is-finished when you need one? Give this woman a raise!" And on that day, I got all jovial and carefree, embracing my husband's mixed-up phrase, "Praise-elujah, Halle-Lord!" And I quickly thanked God for people like her. I really did. She was refreshing. She laughed. She called me honey. And I didn't need a dictionary when she talked. After all, I certainly know craaappy. oh my goodness!! this is hilarious! hmmm... maybe i should check that number on the back of my vacuum. But did the store take back your vacuum??? ?